This is my attempt at the Hero Prop as I think it was at the beginning of the filming of Blade Runner. I have studied Karl's wonderful Worldcom pics and also many HD Screen captures. This is made from all original gun parts and custom made steel parts, namely the bolt with probe and front cap. I think I am probably 90% there but as this is still very much a work in progress, any comments, criticism etc would be most welcome! Ahhhh...there they are. VERY NICE! Thank you for sharing those pictures with us!! Absolutely amazing and gorgeous. That receiver looks in wonderful condition and the bluing looks terrific! Awesome. Lots of inspiration for my snubby. BTW: the links are broken, but if you cut and paste into a new window you will be fine. I suggest the author of the initial post should go in and fix them. OK, now that is just amazing...bordering on insane! Magnificent!! That looks just unbelievable. . . So unbelievable that I must see it in person to make sure it's real. Please PM me and I'll give you my address. I've fixed the links, changing them to embedded photos instead (for some reason the parentheses seem to have been confusing the board's software). Oh, and BTW, HOLY %$#%!!!! That looks amazing! HOLY %$#%!!!! That looks amazing! ^Quoted for truth^ x UN-FRAKKING-BELIEVABLE x a bajillion. The screw is actually screen accurate. 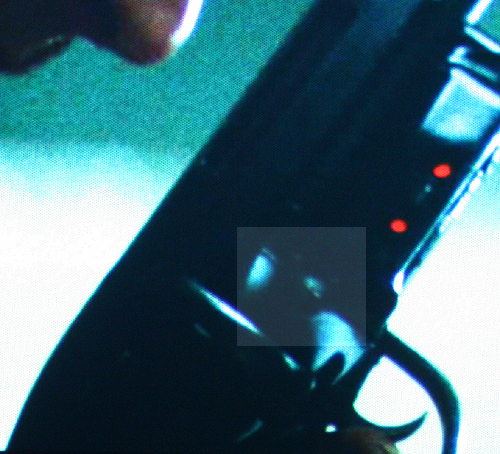 On the Blu-ray and HD-DVD, when you look at the very end of the film, when Deckard pulls the sheet off Rachel in his apartment, you can just make out the shape of the rounded screw head and slot on the hero prop. 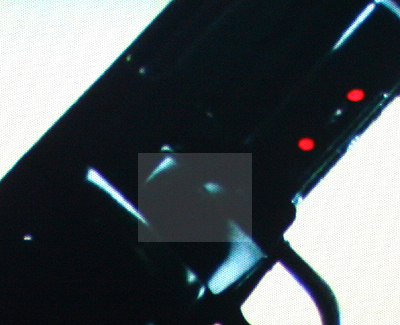 I believe the rubber stunt guns all exhibit the screw head as well. If I'm not mistake, the Weaver knob is unique to the hero prop as it appeared at Worldcon, and must have been added after filming. I actually like the look of the Weaver knob better, but it just doesn't appear on the prop as seen in the film as far as I can tell. And I agree - that's dandy work on the prop build. Looks pretty nice! I think someone did a lighting test with the weaver and the result was it looked the same has the screw head. so it could be a trick of the lighting. Fantastic looking piece! It'll be hard for anyone to top this build! That is beautiful! HoI have to ask, how long did it take to gather all the proper pieces? Bill, any chance of a screencap of the slotted screw for us all to take a gander at? Posted: Mon Dec 17, 2007 2:31 pm Post subject: AWSOME! Wow ...that made my day ! Really I would be thrilled to own something of this quality! Sure. I'll post the actual screen grabs off the high-def versions when I can, but in the meantime, these are photographs of the shot in question from the Blu-ray Disc taken off a 110-inch projection screen. They show the rounded/hemispheric reflection of the light off the screw head, and you can make out the dark shadowed line of the slot. It's clearly not the Weaver knob, which is completely flat and also has additional markings on it. They're a little blurry, but I think you can see what I'm talking about. Again, I'll post actual frame grabs when I can. If anyone can frame grab the HD-DVD or Blu-ray sooner, please do so. Well, thank you ALL for the terrific compliments, I really didn't expect so much enthusiasm! Spinner: as a matter of interest I took most of the Steyr blueing off and have gradually blued it again myself (you have to be careful with that stuff as it is VERY poisonous, fatal if swallowed in small amounts!) 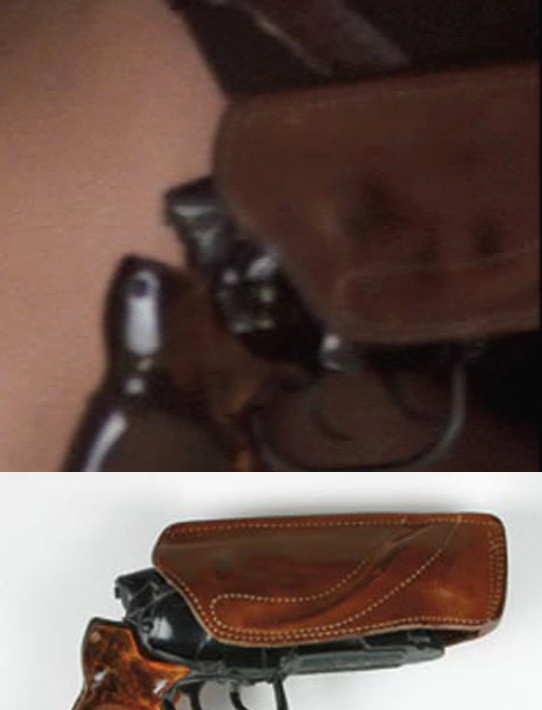 but I wanted to match the hero in colour as it is in the top pic below: Dark gray almost black receiver, but a much lighter gray, shiny bolt handle. I have another publicity still that shows how much lighter & shiny the handle was. superjedi: thanks for the offer but I don't fancy that length of journey. Perhaps I could just send you the gun to admire and trust you to send it back to me?? Yes it has to be the flat screw which was unquestionably the film version. (HD screen caps and don't forget the two rubber stunt prop castings prove this). I can't imagine for a moment that it was ever lost during filming either. Looking at the dreadful neglect that the hero has suffered since, I am 100% sure that it has been lost and an improvised replacement used by it's new owner. It's an important piece, as it screws through and holds the cylinder in place. amish: I started hunting for the receiver in July 2005 and it has been a full time hobby since then. Everyday I have spent some time on the project. I had all the pieces two years later. I have to say at this point a HUGE thank you must go to the legend Rich Coyle and also to Craig Kovach for their invaluable assistance and expertise!